“Undeveloped, wild country” – that’s the best way to describe the Black Rock Desert-High Rock Canyon Emigrant Trails National Conservation Area. Or, if you’re one for blazing your own trail, you can just call it heaven on earth. With the exception of a few short trails, there are no established routes in the NCA. Instead, you’ll discover a multitude of canyons, ridge lines and peaks where few humans have traveled. While there are no constructed hiking trails in the NCA or the ten wilderness areas, there are ample opportunities for cross country wilderness hiking and hiking along primitive two-track roads in the backcountry. Many canyons throughout the NCA and wilderness areas provide perennial water sources and there are springs dotting the mountains, which allow for day hiking and long distance overnight hiking (purify water before drinking). If you are used to hiking on constructed trails, be sure to budget extra time to hike similar distances cross country. Also be sure to pack extra water, since springs and water sources are not always reliable. The Desert Trail is a Canada to Mexico orienteering route that uses trailheads and checkpoint references along an 80-mile route through Black Rock-High Rock Country. The route meanders across the playa, into the mountains, and through the canyons of the NCA and Wilderness Areas. 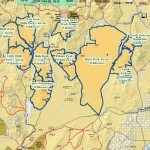 Maps have been developed for the High Rock Canyon portion of this trail. A comprehensive guidebook is available for the three segments crossing the southern portion of the NCA. King Lear in the South Jackson Mountains Wilderness, at 8,923 feet, is the highest point in Black Rock-High Rock Country and features a nearly 3,000 foot clear prominence at its top. Pahute Peak (pronounced “pie-yoot”) or “Big Mountain” in the Pahute Peak Wilderness, at 8,594 feet, provides great views of the northern part of Black Rock-High Rock Country. Donnelly Peak is centrally located in the Calico Mountains Wilderness, and at 8,533 feet offers spectacular panoramic views of nearly the entire Black Rock-High Rock Country. The High Rock Canyon Complex offers some of the best opportunities for intermediate hiking and backpacking. Several well watered canyons provide scenic campsites and excellent wildlife viewing and hunting opportunities. Hike through High Rock Canyon, East Fork High Rock Canyon (Pole Canyon) or Mahogany Canyon to explore historic homesteads, catch a glimpse of California bighorn sheep, or follow wild horse trails to the canyon rims to view the expansive plateaus and large herds of pronghorn antelope. Upper High Rock Canyon is a short hike from Stevens Camp, which is located at the north end of High Rock Canyon, along the upper portion of High Rock Creek to a grassy wet meadow. What was once a perilous segment for the emigrant wagon trains is now a delightful hike through an aspen-lined creek. Note: the road through High Rock Canyon is closed from February 1st until the second weekend in May every year. The northern slopes of the Black Rock Range offer unique hiking experiences. The shade and cool running water found in the aspen-lined canyons of the Lahontan Cutthroat Trout Wilderness Study Area provide excellent hiking opportunities, even in the hottest months. Hike up Pahute Peak, the high point in the NCA at 8594 feet elevation, for 360° views of the NCA and Wilderness. These areas are best visited in the summer season, June through September. The Calico Mountains, located on the western edge of the Black Rock Desert, offer outstanding opportunities for hiking. Most of the larger canyons leading out of the Calico mountains have perennial water and shade trees in the upper portions. Check out Donnelly Creek, Cherry Creek, Willow Creek, Petrified Canyon or Box Canyon (dry) for interesting canyon hikes. Summit Donnelly Peak, the high point in the Calico Range at 8533 feet elevation, for sweeping views of the playa, High Rock Canyon and the surrounding mountain landscape.